I sit in an office, or maybe it’s the back room of a store, or at a small table in a living room. I ask my customer what she is looking for: is there a specific stone she is drawn to? I have a bowl full of stones to look at as well as other resource books on crystal meanings. Would this be a gift for someone or herself? Is there a quality she would like to embrace in herself more? Something she wants to let go of? Something she wishes to protect? Are there any symbols or shapes she is drawn to? I ask her record her dreams for a week and tell me any details that stick out to her. Once I have information I spent time brainstorming. I show her some sketches. She gives me feedback about what she is drawn to, and why. At this point, we discuss materials and price. 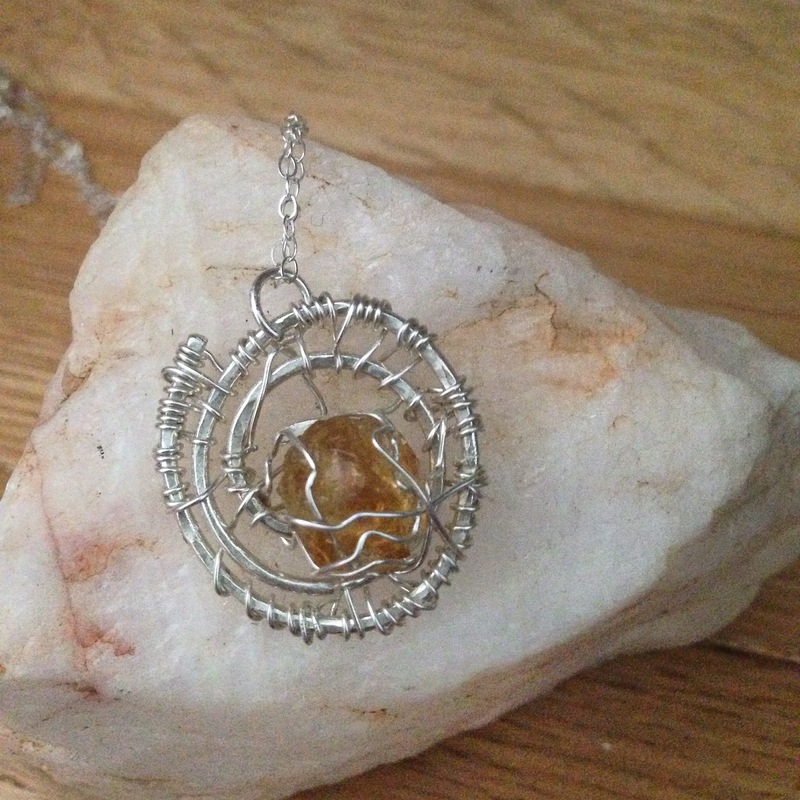 Then I create, playing with wire, gemstones, and intuition. I would like my jewelry design and art business to have an intuitive custom aspect, where I combine my energetic and artist gifts to create one-of-a-kind pieces for people. I’ve made a custom piece for a friend, and I really enjoyed the process: it was experimental, collaborative, and very satisfying. My energy healing training: I am Reiki Level 2 attuned and I’ve also done some informal training based on the teachings of the Berkeley Psychic Institute. Energy work feels like it comes naturally to me, but training and attunement has made it easier for me to access and sense energy. I also identify as empathic, and can pick up on others’ emotions. I want to continue to integrate these skills and abilities into my creative process – it feels healing for me, and I hope it will help others as well. I love the idea of setting an intention and working with someone to make something special for them or a loved one. If you are interested in ordering a unique, intuitively-created piece, let me know. You can contact me here.